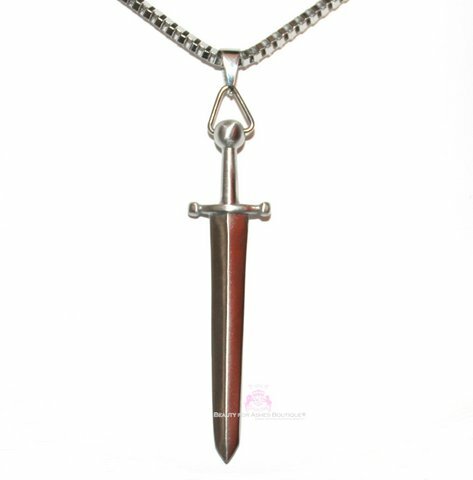 This amazing sword pendant and neckchain is made of stainless steel. The pendant measures 3 inches long without the bale. The blade features a matte pressed brushed finish and the handle of the sword a matte pressed brushed finish. The neckchain measures 30 inches long. 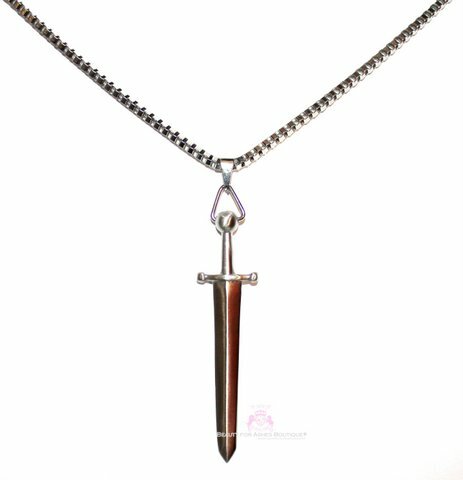 The neckchain is a box chain 3mm wide. The sword of the Lord is anointed with prayer and is a reminder of Hebrews 4:12 The word of God is living and powerful, and sharper than any two-edged sword, piercing even to the division of soul and spirit, and of joints and marrow, and is a discerner of the thoughts and intents of the heart. And there is no creature hidden from His sight, but all things are naked and open to the eyes of Him to whom we must give account.